There are several factors to consider when choosing a gate for your property. Not only do you need to decide what look you want and what material will work best, but you also have to have a firm grasp on what it is that you want the gate to do for you. Is it purely decorative or is it needed for a specific purpose? The experienced team at Rustic Fence has been installing fences in the Arlington, TX area since 1964 and suggests you first consider the following factors before choosing a gate. Check With Your POA/HOA for Guidelines– It is essential to be aware of any restrictions or requirements your neighborhood may have that pertain to gates. Some communities have rules limiting the type, appearance, and materials of gates. Once you are sure of what is acceptable, you can then decide which style will work best for your property’s needs and the look you want. Learn Available Gate Styles – Make yourself aware of the different styles of gates available. Choosing a gate that matches the style of your home which will improve the aesthetic and add value to your home. Selecting the right type of gate – slide, swing, ornamental, chain link, iron, chain link, etc. is dependent on a variety of factors. A guide for selecting the right type of gate is listed below. Educate Yourself About Types of Gate Access– Decide on what type of access your gate will provide. Factors, such as the level of privacy or security desired, play a significant role in the kind of gate access that will work best for you. Manual access allows you to walk up to your gate with a lock or a code. Drive-up access offers convenience and the use of either an electronic key, code, or swipe card for access. Remote control access which is similar to garage door openers. Or, intercom access, which is the most secure gate option for privacy and security. Know How You Will Power Your Gate– All gates except manual gates will require power to operate. Your gate can be powered by the same source as your home, or via solar power, which is an eco-friendly way to power your gates and save money. It also means that your gate will operate even in the event of power loss due to an outage. Evaluate Your Useable Space – The amount of space available can determine the type of gate you can use in your Arlington, Texas home. If you have ample space where you can comfortably accommodate any front gate design, the options are limitless. However, small areas need to work within the limitations and may require the use of single and sliding gates that require less space. Once you know everything you need to about your gate needs and property requirements, you will have a good idea about which type of gate will work best for your home. Here is a look at the different types of gates and examples of the best uses for them. Slide Gates – An excellent choice for any driveway, yard, or enclosure, slide gates increase safety and add a beautiful curb appeal to your property. Options for slide gates typically include color, size, shape, and how the gate will slide open. Custom slide gates can be created from a variety of materials including iron and wood to match your style preference. Custom Ornamental Iron Walk Gates – Create a unique look with an ornamental iron walk gate for your Texas home. These strong and durable gates offer custom design features such as unique family symbols, state symbols, and other creative details from ornamental iron. Your ornamental walk gate is guaranteed to withstand the test of time while blending beautifully with your property. They also look great when paired with an iron fence. Swing Gates – Swing gates are a great option to use when a gate, or gates, needs to swing inward or outward to open. Swing gates are typically used for residential purposes and commonly combined with decorative fence panels. Chain Link Gates – This is a great multipurpose gate and a form of security that will work well for any size area. Long-lasting galvanized gate frames that aid in both longevity and strength will keep your gate from being compromised. Iron Entry Gates – If you’re looking for a strong and dependable safety gate, iron entry gates are a popular choice. Iron entry gates are available in a variety of shapes and styles and help to prevent cars or intruders from entering. At Rustic Fence, our goal is to provide you with a gate that you can confidently trust. 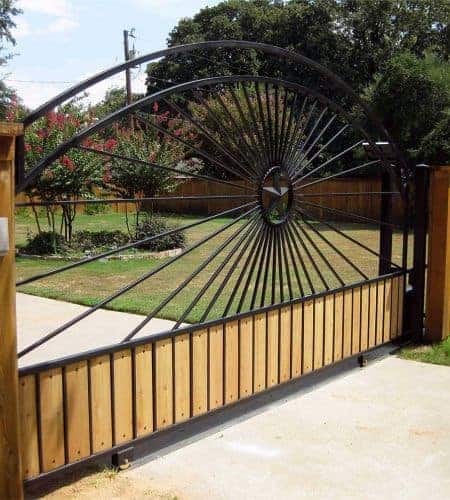 We have had the privilege of providing gates to clients in the Arlington, TX area for over 50 years and can help you choose the best gate option for your property.